Passover at Etz Hayyim is somewhat like a family gathering as over the past ten years the community During the times when it was felt necessary to expand on the Haggadah special mention and note was made of the fact that Passover is about fleeing from idolatry in all its forms – even perhaps the idols that one makes of concepts and practices that perhaps impede our spiritual growth and freedom. 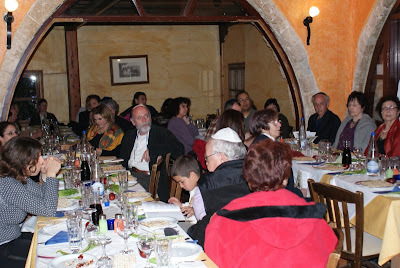 Seder attracts a good number of people who return annually to celebrate with us here. This year we were prepared to see perhaps fewer participants due both to the ‘crunch’ as well as the arson attacks. Invitations were sent out as usual and response here in Hania seemed to indicate that we would have a fair attendance though it seemed unlikely that we would have the usual quota of visiting Israelis and Jews from Europe on vacation. 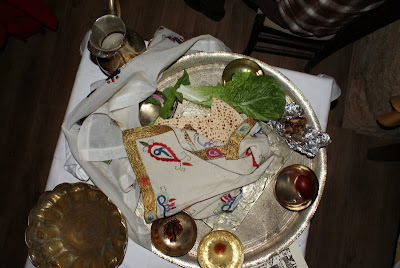 We lay in provisions from Athens – matzoth and wine and chose a traditional Sephardi menu of non meat dishes – and even had the ‘korban’ pre-roasted in Athens and sent by courier. Nicholas de Lange arrived in good time and after getting copies of our last year’s haggadah printed up we set about making arrangements with a nearby restaurant that we have used on former occasions. Everyone assembled at the Synagogue for Arvith prayers and then made their way to the restaurant and we, Nicholas de Lange and myself, took on the part of readers. During the times when it was felt necessary to expand on the Haggadah special mention and note was made of the fact that Passover is about fleeing from idolatry in all its forms – even perhaps the idols that one makes of concepts and practices that perhaps impede our spiritual growth and freedom. Almost 60 people attended the reading of the Haggadah and after the hiding of the Afikomin set about serving themselves from a buffet of traditional Sephardi food. At the end of the meal the cup of Eliahu was filled with wine that was taken from everyone’s glasses and the door was opened to the street as we said the thanksgiving prayers. We are especially happy that some friends arrived from Turkey as well as the young Palestinian who helped me the night of the first fire and the friars from the nearby Catholic monastery…thus the sense of members of one widely extended family – Jews, Christians and Muslims was very evident. The Reform synagogue was designed by the firm of Palmer & Hornbostel, and it is Henry Hornbostel's design. The following account of Hornbostel's work quotes from the text and notes of my 2003 book American Synagogues: A Century of Architecture and Jewish Community, pp. 40-45, 229-230. Hornbostel was one of America’s foremost classicists, for for this project he employed a more contemporary European style. Hornbostel graduated in 1891 at the head of his class at the School of Mines at Columbia University, and shortly thereafter left for Paris where he studied at the Ecole des Beaux-Arts, and where he worked for Charles-Louis Girault (1851-1932), a prominent practitioner of the decorative classicism popular at the turn-of-the-century. The style is most evident in the 1900 Paris exhibition, for which Girault designed the Petit Palais. Rodef Shalom is the oldest Jewish Congregation in western Pennsylvania. The first building was erected in 1862 on Hancock Street (later Eighth Street), designed by Charles Bartberger. Within a year, the congregation became a leader of the new Reform movement. Services were shortened, the women would sit with the men and an organ was installed. By 1874, the practice of wearing of a hat or yarmulke by the men was abolished, and Rodef Shalom joined the Union of American Hebrew Congregations. Reform leadership was cemented when the Temple hosted a conference of Reform rabbis in 1885, who created the "Pittsburgh Platform'' that guided Reform Judaism until 1937 when a different Platform was adopted. In my book I wrote that "legend has it that Hornbostel beat out Albert Kahn" (who had designed Detroit's Beth El) for the commission. Martha Berg, archivist of Rodef Shalom has since informed me that not only did Palmer & Hornbostel beat Kahn, but that six distinguished architectural firms had been invited to submit designs for the building. These also included Allison & Allison of Pittsburgh and Charles Bickel of Pittsburgh; as well as George Post & Sons of New York; and Pilcher & Tachau of New York. According the Berg, Bickel had designed the second Rodef Shalom building just a few years before (1901) on the site the first building. About the same time Tachau also lost out on the competition for Temple Adath Israel in is native city of Louisville, be shortly afterward he and Pilcher would design the innovative classical style Mikveh Israel Synagogue in Philadelphia, and Tachau would go on to design several more impressive synagogues through the 1920s and also write about synagogue architecture. The result of the competition was quite new to American synagogue architecture, while still within the tasteful norms of Jewish mercantile-industrial society. Rodeph Shalom, built in 1907, has a distinctly Central European flavor, quite distinct from Hornbostel’s otherwise mostly Classical oeuvre. Architectural historian Franklin Toker has cited the 1883 Budapest train station as a possible source for Hornbostel’s design. The design also recalls world’s fair pavilions, such as those for the Paris Exposition of 1900, on which Hornbostel worked with his teacher at the Ecole des Beaux Arts, C. L. Girault. The Reform synagogue is situated at the northwest corner of Fifth and Morewood Avenues in Pittsburgh’s fashionable Oakland section, close to several churches, including the 1904 Classical First Church of Christ, Scientist located directly across the street and designed by Chicago architect S.S. Beman. 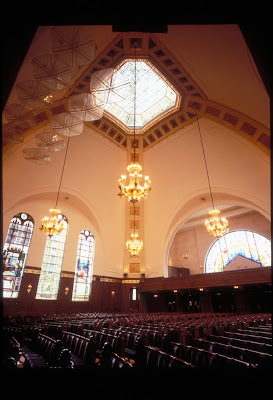 It is typical of many “second settlement” synagogues of the period, erected as public buildings around parks and newly designed civic centers for more affluent Jewish populations that had removed themselves from dense urban neighborhoods. One of the significant innovations in the design was the introduction of color—both inside and out. The architectural press of the time stated that the work was "artistically accomplished as to present an attractive and harmonious effect. The entrance feature and the frieze that encircles the building, executed by the Atlantic Terra-Cotta Co., may be regarded as one of the most successful attempts in this direction that has been accomplished in this country. The entire building, with its green dome, buff brick, the polychromatic effect of the terra-cotta, presents an effect highly creditable to the architect and a delightfully restful spot in what would otherwise be a monotonous and uninteresting thoroughfare." (The American Architect and Building News, XCIII: 1682 (March 18, 1908). The groined dome of double shell construction is entirely composed of Guastavino tile and has a clear span of 92 feet. The tile is strong enough to replace the steel construction originally intended. The upper, or exposed, shell of the dome is covered with green glazed terra-cotta tiles. Inside, the dome is covered with decorative plaster. At the center is a large octagonal stained-glass skylight. As in many new synagogues of the period, individual, theater-style seats are used, and each rack of seats terminates at the aisle with a pew end or post. The engineering of the synagogue, as well as its religious programming, were up-to-date—it was mechanically ventilated and heated by direct steam system. A Sunday school was placed in a wing to the rear of the main auditorium along with an assembly room, classroom, clubroom, library, and rabbi’s study. In 2003, I focused more on the place of this synagogue in the Jewish context, but not in its local context, except to mention its proximity to the First Church of Christ Scientist. Though I mentioned that that congregation was able to engage Hornbostel because he was on site as Andrew Carnegie's architect of the new Carnegie Technical Institute (now CMU), I didn't relate the synagogue to the Carnegie designs. This was a mistake, because it is only in the context of the campus buildings that one fully understands the significance of Rodef Shalom's design. The things that are similar are important, and so are the distinctions. Much of the constructional detail of the synagogue - the yellow brick, decorative tilework and use of Guastovino vaulting - is also fond in the CMU buildings (competition 1903, open 1906 ff), and this continuity links synagogue to campus. That in itself is a remarkable association at the time since overt Jewish presence on or even near American campuses was virtually unknown. The CMU buildings, however, are more overly classical in design, something Hornbostel and the congregation chose to avoid in the new synagogue...thus making it a stylistic exception to the many new classical-style Reform synagogues being erected across American in the first decade of the 20th century (about which more in an upcoming article. (ISJM) Marcus Roberts of National Anglo-Jewish Heritage Trail (JTrails) in Northampton, England has presented evidence for the possible - even likely - identification of a site in that town as the remains of a medieval synagogue. A survey using ground penetrating radar, carried out in partnership with Birmingham University, has identified stone walls and what appears to be a stairway and entry, possibly confirming known descriptions of the former Northampton synagogue which according to Roberts is recorded as a sunken building, entered by steps (‘and a fair and stately hall’) in an account of Northampton buildings before the Great Fire of 1674. An illustration in a bird’s eye view map of 1634 appears to show the same building where we detected the sub-cellar remains. A survey of land underneath Kebabish (a kebab shop) and The Bear Public House, both in Sheep Street, Northampton, has identified what may be the remains of a synagogue which would date to the period before the expulsion of Jews from England in 1290. Roberts told the Northampton Chronicle & Echo (April 9, 2010): " It ...showed what appears to be two walls going down 14 feet underneath cellar level. There was also a square or rectangular structure next to it which may well have been a stairway going down into the synagogue." Roberts further told me that "the very substantial building was a sunken structure in the medieval period, an adjacent wall in the pub cellar appears to be an up-wards extension and adjacent structure to the sub-cellar finds, which could thereby be a visible remnant of the synagogue wall or an adjacent Jewish building and is at least six feet thick." Last year, an archaeological survey in Northampton discovered what Roberts believes is the site of a 12th century Jewish cemetery of the city. In the case of the new find, Roberts and project partner Caroline Sturdy Colls, a PhD archaeology student at Birmingham University, both warned they could not be certain of the nature of the remains without excavating the site. Based on the historical and documentary evidence, Robers is confident that Sheep Street was once home to a medieval Jewish settlement and synagogue. But even if the identified remains are part of a former Jewish street, much more evidence would needed to prove they were also part of a synagogue. One remembers that controversy and disagreement on the identification of the massive Romanesque structure excavated in Rouen (France). That episode is a lesson that despite the lack of many many large Jewish communal structures of the period surviving today, there may have been more than we presume. Not every significant building in a Jewish quarter or on a Jewish street need have been a synagogue. But Roberts told the local paper "But we thought we would find the synagogue there and what we have found is an extremely substantial medieval sunken building." To date there are no confirmed remains of medieval synagogues in England. In the 1990s a small structure with built-in benches was excavated in Guildford and was quickly identified as a likely synagogue, but experts now disagree over its original use. Excavations in London in recent years have revealed remains of houses of local Jews and of mikvot, but no synagogue. Alexander, Mary, 1997. “A possible synagogue in Guildford,” in G. De Boe & F. Verhaeghe, ed.s: Religion and Belief in Medieval Europe – Papers of the Medieval Europe Brugge 1997 Conference, vol. 4, 201-212, I.A.P. Rapporten 4, Zellik, 1997. Blair, Ian; Hillaby, Joe; Howell, Isca; Serman, Richard; and Watson, Bruce, 2001. “Two Medieval Jewish Ritual Baths – Mikva’ot – found at Gresham Street and Milk Street in London,” Transactions of the London and Middlesex Archaeological Society, Vol. 52 (2001), 127-137. Isserlin, Raphael M.J., “Building Jerusalem in the ‘Islands of the Sea’: The Archaeology of Medieval Anglo-Jewry” in S. Kadish, ed., Building Jerusalem: Jewish Architecture in Britain. Vallentine Mitchell, London and Portland, Or., 34-53. New York, NY. Schiff fountain in its original position with Brunner's Seward Park Bath Pavilion on left - facing Essex Street. Photo courtesy of New York City Parks Photo Archive. New York, NY. 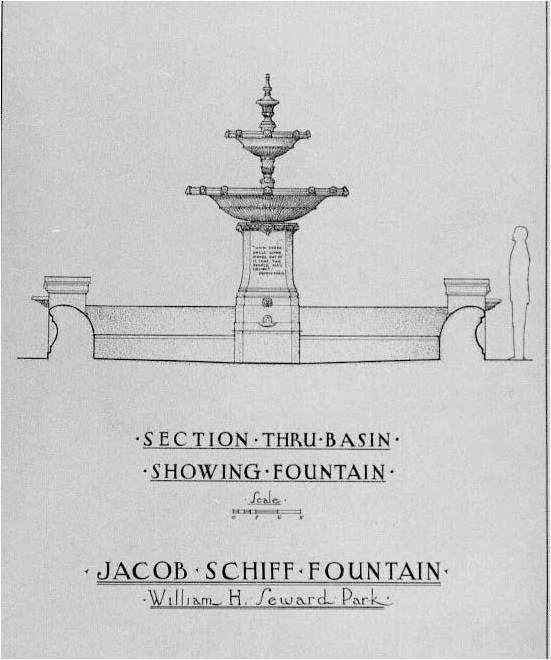 Section drawing of Schiff fountain, probably from the 1930s. Photo courtesy of NYC Dept of Parks/Recreation. New York, NY. Schiff fountain in the 1980s, still essentially intact. Photo courtesy of New York City Parks Photo Archive. New York, NY. Seward Park. Schiff Fountain in present condition. Photo: S. Gruber 2010. Turn-of-the-20th-century financier and philanthropist Jacob Schiff and American Jewish architect Arnold W. Brunner had a long and productive relationship, especially when it came to designing useful buildings to aid the material and cultural condition of New York City Jews. Brunner designed many charitable and educational structures funded all or in part by Schiff, and many of these were on the Lower East Side. Brunner especially made a mark on the small area around Rutgers Square located between Seward Park and the The (former) Forward Building. One of the earliest Brunner-Schiff collaboration was the five-story Educational Alliance, built in 1891 (Brunner and Tryon, architects), and still in use. In 1904 Brunner designed the Bath Pavilion for Seward Park, but this was replaced in the 1930s. Given the history of the fountain, Schiff's concern with upkeep was legitimate. Within a short time the fountain was being regularly defiled, with its basins field with garbage. To counter this, according to the New York Times (Sept. 27, 1895). 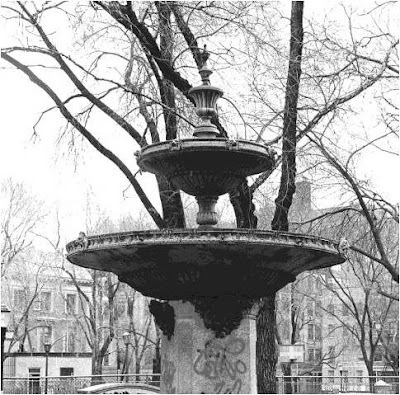 The Henry Street settlement organized neighborhood boys to watch over the fountain. The fountain was moved in 1936 to its present location on the western edge of Seward Park. Ironically, this was the same year that Brunner’s Pavilion in Seward Park was demolished. New York, NY. Seward Park Pavilion, Arnold W. Brunner, architect. Built 1904-05, demolished ca. 1936. Architectural League of New York Annual Exhibition Catalogue,1903. Since then the fountain has deteriorated. I was recently in the neighborhood and noted its broken condition and inquired to the City of New York/Parks & Recreation, Department of Art & Antiquities, which has (until now unsuccessfully) promoted the fountain's restoration. The fountain consists of large circular ground level basin in the center of which is a pedestal supporting a small raised basin. Originally it had two bronze basins surmounted by a finial, an attached drinking fountain with bronze appliques with grotesques at the spouts, and granite semi-circular seats set apart from the fountain itself. The stone seats have been relocated to opposite ends of the park and the lower basin is all that remains of the fountain itself. New York, NY. Seward Park. Schiff Fountain inscription. Photo: S. Gruber 2010. "... and there shall come water out of it, that the people may drink." I visited Rensselaer Polytechnic Institute (RPI) this weekend with my son (who has been accepted and is considering attending in the fall). I was impressed with the campus, and noted the prominent placement of a project to mark Yom ha-Shoah (Holocaust Remembrance Day) created by RPI students. The project is an installation of thousands of colored flags on the former sports field near the center of campus. The colors denote different groups of victims of Nazi policies of destruction, murder and genocide. The installation was created by the campus's Holocaust Remembrance Committee, a group of students "dedicated to raising awareness, commemorating, and providing a forum for students, faculty, staff, and the community to reflect on how the Holocaust and Holocaust commemoration can be meaningful to us today." You can read my discussion of the current exhibition Uneasy Communion: Jews, Christians, and the Altarpieces of Medieval Spain in The Forward newspaper. The exhibition is on view until through May 30th. It is accompanied by an informative and beautifully illustrated catalog with essays by exhibition curator Vivian B. Mann, Marcus B. Burke, Carmen Laccara Ducay and Thomas F. Glick. Published April 07, 2010, issue of April 16, 2010.